Ready 4 Summer Blog Party - DAY 5 - Summer Entertaining plus Linky! I can't believe we're already at the end of this marvelous blog party! We've had so many inspiring projects linked up...thank you! And our guest bloggers have done a knock-out job with the projects they've contributed. Thank you so so much to all of you who have participated! Today's theme is SUMMER ENTERTAINING! Woo hoo! I love all of the ideas available for entertaining in the warmer months...the colors, the food, the activities...all of it. So today I wanted to share some of my favorite entertaining ideas with you. I found all of these party ideas on Pinterest (are you surprised?). 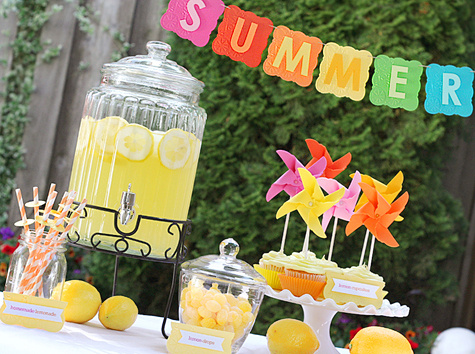 That darling little banner just screams summer...and ummm...lemon cupcakes? Oh yeah. 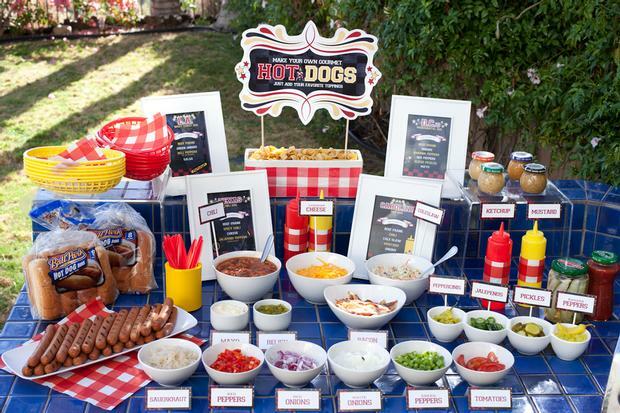 Next up is this BBQ Hot Dog bar from Jenn Sbranti at Hostess with the Mostess. Oh heck...so cool. Now it wouldn't be summer without pool parties, right? 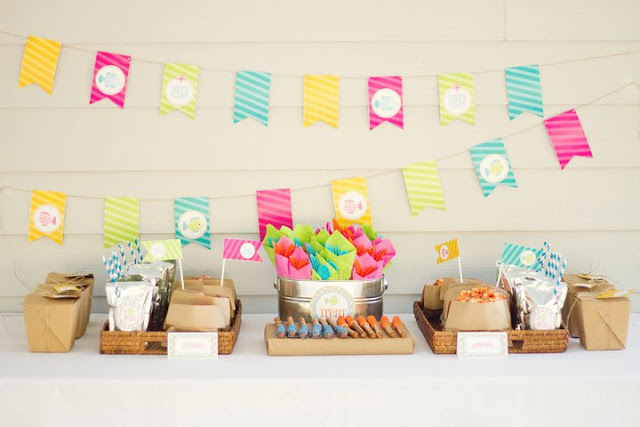 This darling little pool-side party from Party On Designs (I found it at Kara's Party Ideas)...could easily be adapted for older kids, or even adults. I love the water bottles, the way they wrapped the silverware, and little containers with the brightly-colored candies...oh my gosh, everything is just so pretty! 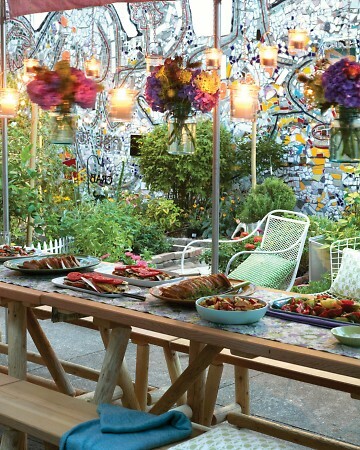 And finally, this Community Potluck party from Martha Stewart would be so much fun! How great would it be to just gather a few neighbors and have an outdoor potluck...oh my gosh, my "to-do" party list just keeps growing & growing. For more summertime entertaining ideas, make sure to visit these amazing blogs today! How about you? Do you have any amazing summer entertaining ideas you like to share? Cuz we wanna see 'em! Link up any time this week and be sure to check back for even more summertime inspiration! Thanks so so much for partying with us! We hope you've loved this party as much as we have! Thank you so much to all of you who have contributed to it's success! Such fabulous ideas, thanks for letting me join in on the fun this week. Those are all simply amazing! It makes me want to do some summer entertaining! 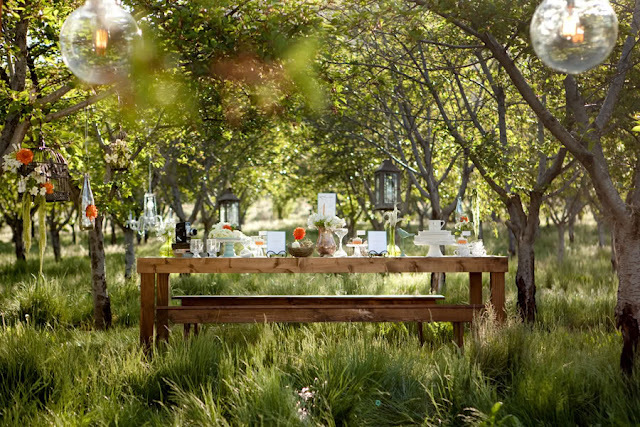 I keep thinking about that table out in the grove of trees!! My parents have a big grove on a couple acres... I think I need to plan something fun! !